Hello beautiful readers of ChrissyAi.com! I'm Traci from drinkcitra.com. Christa is one of my dearest blogger friends and I'm very excited to have been given this chance to share a post with you here! Thank you so much for the opportunity to post on your blog, Christa! I would like to introduce two black and white glitter polishes I received from Victoria, the maker of a polish line called Serum No 5. These are the first black and white glitters that were added to my polish stash and I couldn't wait to try these out! I used Maybelline's "Impeccable Greys", a deep grey shade, for the base, and topped it off with Serum No 5's "Thanks for the Memories" and "Happy Special Day". "Thanks for the Memories" has a beautiful combination of blue and green glitters, while "Happy Special Day" is accented with a rainbow of glitters! Thanks for reading and thank you again for having me, Christa! 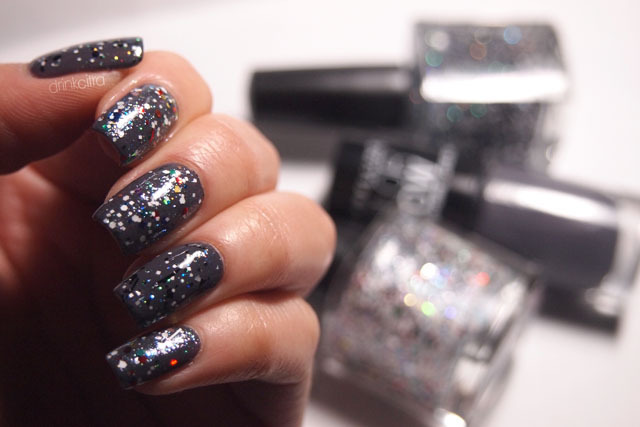 This is so cute, I love the dark grey with the pop of colors of the glitter! Love it -- reminds me of graffiti! Pretty nails, I love the glitter! YAY TRACI!!! Adore you to bits!! And LOVE this mani! So flashy :-) I agree- It reminds me of fancy urban street art, too! Love it! love traci! she's been the same for me and im so glad I've made such an awesome blogger friend! i know i can always count on her to comment and like all my instagram pictures! love you traci!